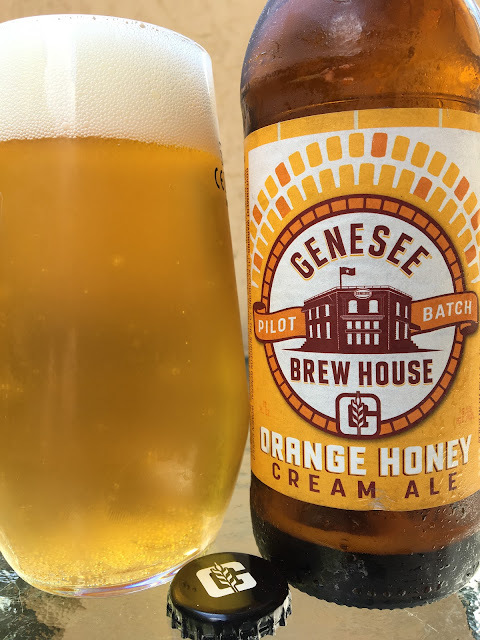 Today I'm checking out Genesee's Brew House Pilot Batch Orange Honey Cream Ale. This is a beer brewed with orange, honey and spices. 6% alcohol. 11 IBU. Pleasant orange and honey aroma, with the spices coming the more you sniff. Tasty. Pronounced sweet honey with some orange citrus. Nice creamy texture. Spicy with ginger and nutmeg and a kiss of cinnamon, felt like that "pie" character, but bordering on the "way too much" side. Definitely a little sweet, but big nice flavors. Not bad. Check it out!